These guys are me heros! A tec named Jason was my knight and shining armor. He came to my rescue the day after I found cockroaches in my kitchen and I had family coming soon. He looked around, gave me the best options to be safe around my child and dog and did an amazing job treating. I never saw a live one after. He even told me what they look for and that to do to make sure they did not thrive. I'm calling these guys from now on. Jason, if you see this, THANK YOU!!!!! Get a great job spray and for roaches Was on time fast and reliable. Come in and sprayed for spiders and Other bugs did an excellent job very fast or reliable would definitely use Jason Wolpern again. 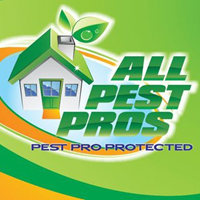 All Pest Pros are truly the PROs. From the first phone contact for appointment to the actual completion of work it goes smoothly. The guys that come to service are courteous, competent and professional. I have had Enrique, Ryan and others. They have all exceeded my expectations. I used their services for Rodent exclusion work which has been very effective. I recommend them whole heartedly! !..